Cant find any other word to describe Goosh’s night time explorations. He crawls. While he’s asleep. 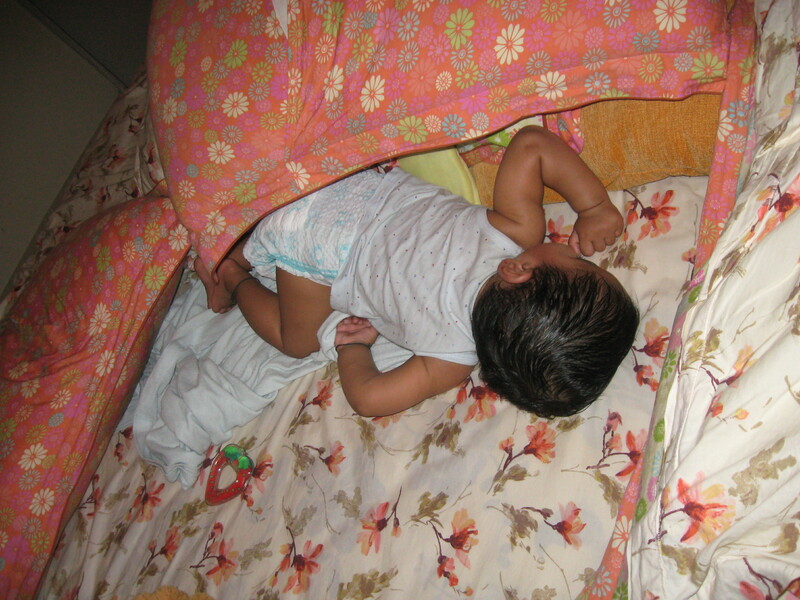 As a lil baby, he used to roll about the bed, and even complete full cirlces. Then came the stage where he was learning to crawl. And he’d continue into the night. He’d sleep with his bum in the air, knees tucked under, frog like, all ready to launch himself. Once he mastered crawling, he doesnt want to stop. Even after he’s asleep. Often he wakes up crying because he’s crawled up and banged his head on the headboard. Already once this week, he’s been rescued with his head hanging over the edge of the bed, his feet perched on top of the pillow fortress. Yes, he climbed over the pillows from this side, and down the other. What prompted me to wake up just in time, I dont know. And another time we werent so lucky. I was in the loo. For just a minute. And our man sprinted over the pillows, onto the floor. A few days I tried putting some unused rajais on the floor around the bed. And tired of it. The Pillow Fortress no longer works. Tomorrow I meet the carpenter to see if they can make a barricade around the bed. And if that doesn’t work, heck, I think I’ll just sell the bed and sleep on the floor! Ya, a photo crazy Mom trying to get a shot of the new star tooth! I got home from work today, and Goosh was no where to be seen. He’d gone down for a walk with his Grandpa. I washed up and I waited for him. As the walked in through the door, I sneaked up softly from behind meaning to surprise Goosh. Before I could reach them, he turned around. Saw me. Instantly let out a whooping joyous gleeful yell and jumped into my arms. The simple joys that make it all worthwhile. It’s morning. I dont know the time. But I do know that I want to sleep some more. The lil fellow twists and turns, and i hold him and pat him down, with a silent prayer that he goes back to sleep. Don’t know if it was 5 minutes later or an hour, but I feel a wetness on my nose. There’s a heaviness on my chest. Something’s crushing my right arm. I try to open my eyes. But someone’s clamped down a gooey palm on the left one. The right eye opens to see another eye blink just millimeters away. Something trickles down my cheek. And I hear a chuckle. I try to pul him away from my face. He gives out a war cry accompanied by the widest grin I’ve ever seen. And proceeds to gobble up my nose. Then my right cheek. And dives for the eyes. I hold him off. He manages to get entangled in my hair. Tussle and tumble. Push and pull. Yells and yelps. And I break free. The little fellow was trying to climb over Mommy’s face.